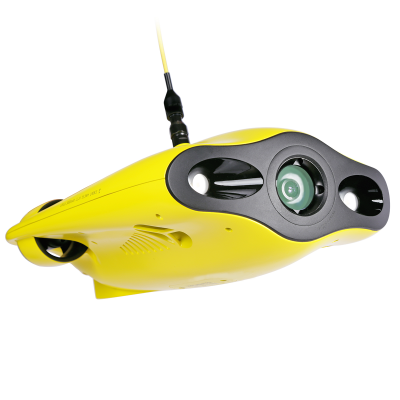 Finally there is underwater drone for filming great videos. GLADIUS MINI is equipped with an Ultra-HD camera that delivers 12-mega photos and 4K videos with a resolution of FHD:1920*1080 30Fps up to FHD:3840*2160(4K) 30Fps. Also for Pros. The Gladius underwater drone stands out in the market thanks to the unique Depth Lock and Tilt Lock functions that make operation very easy and also ensure more stable shots. The solidity (suitable up to 100 meters depth) and great speed and maneuverability by using 5 thrusters make the Gladius drones highly recommended. The super compact dimensions and the very low weight make these drones ideal for traveling. The Gladius is not bigger then a 15" noebook and great for any trip and shoot. Thanks to the cable connection to the base station on land, you can watch the dive live and in high 720P quality with the underwater drone. The wifi connection and internet on your smartphone allow you to to let your family enjoy the holiday by streaming the underwater video live on social media such as Facebook, Youtube and Instagram, or record the dive for example to make diving tutorial videos. The underwater drone also lends itself to pre-diving sites, wrecks and caves. The drone has a approx. 45° adjustable tilt function. This can be regulated to pan left or right and tilt up or down. You can share your underwater experiences to online live stream platforms, such as YouTube and Facebook. Share your underwater videos and photos on social media, with clickling just one button. With the GLADIUS MINI and the integrated VR you can access the real-time streaming 3D video from underwater world. Unique five thruster design allows responsive and accurate navigation in all directions. 3 of 5 thrusters keep stability, while others provide power. The unique design ensures Depth-lock, adjustable tilt-lock, and game-like controlling. This ensures stable underwater shooting from the best angle at any depts and currents. GLADIUS MINI can easily dive up to a depth of 100 meters and makes underwater exploration fun and enjoyable. 2 hours of average runtime is more than enough time to support your cinematic footage.